PLEASE email me at [email protected] with any questions or to place an order. I have been building, installing, and shipping Z28 Clusters for our beloved Caprices/9C1s/Impala SS since April of 2001. Two years ago I began to offer Z28 Clusters for the ’94-’96 Roadmasters. Here is a revised post for the Z28 Clusters I currently offer. I take one of my Z28 Clusters, build my own custom harness so it plugs into your dash connectors, trim the outside of the housing, check and clean all of the bulbs, check the calibration of all the needles, set the odometer to whatever you want. I include a tach signal wire with the correct PCM pin (except the ’96 Impala SS since the car is already wired for the tach signal). Included is a polished (used) lens or an optional new GM lens, and can also install white needles in place of the red needles (think ’96 Impala SS) as an option. I can also make the needles any color you might want. Please note that you lose the Low Washer Fluid, Change Oil, Door Open & Gate Open (wagons) and Low Fuel lamps. You also no longer have a PRNDL with the Z28 Cluster (perfect for floor shift conversions or 6-speed cars). Also, to allow the Z28 Cluster’s oil pressure gauge to display actual oil pressure on civilian cars, you will need to replace the oil pressure switch with a 9C1 oil pressure sending unit, and remove a factory resistor in the wiring harness above the glove box. ’94-’96 Caprice/9C1 and ’94-’95 Impala SS for $285 shipped (within the 48 States) with used polished lens. New lenses are no longer available from GM. 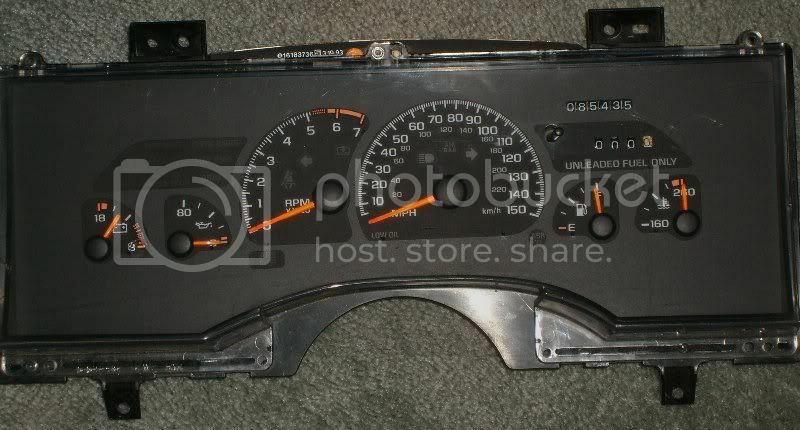 ’96 Impala SS (which includes my purchasing a tach signal divider and building it into the harness so the tachometer displays properly) for $385 shipped with used polished lens. Gray painted gauge separator $25. White needles (or any other color needle) instead or red needles $25. 9C1 oil pressure sending unit $30. You can save $50 off the above pricing if you already have your own Z28 Cluster and send it to me, I will complete the above listed modifications and ship it back to you. If you can send me the connectors from a digital B-body cluster you can save an additional $25. 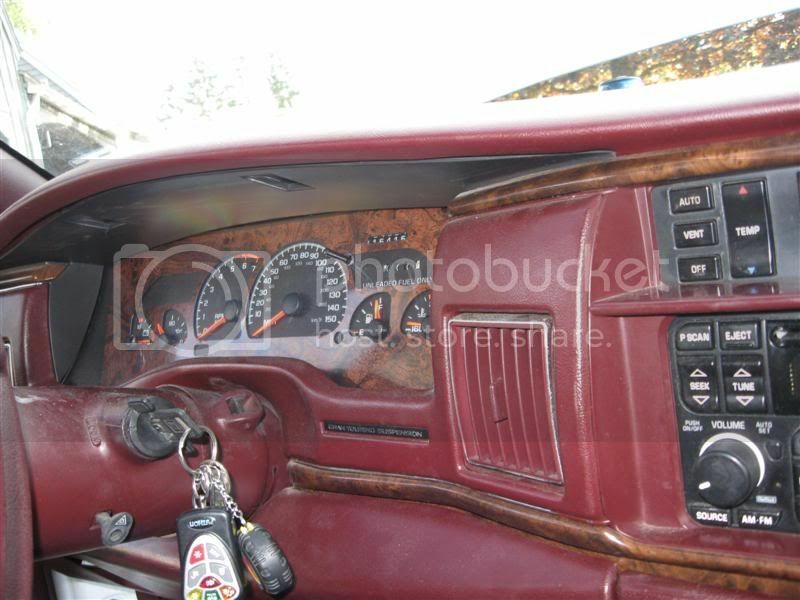 I take one of my Z28 Clusters, build my own custom harness so it plugs into your dash connectors, check and clean all of the bulbs, check the calibration of all the needles, and set the odometer to whatever you want. I assemble it all with one of my custom faceplates in matte black. I include a tach signal wire with the correct PCM pin, and a used polished lens. I can also paint the faceplate whatever color you can provide me, or cover the faceplate with (stick-on) carbon fiber or woodgrain (to closely match the Roadmaster interior woodgrain). In keeping with the Buick factory gauge look, I can also install white needles in place of the red needles as an option. Please note that you lose the Low Washer Fluid, Change Oil, CRUISE, Door Open, Gate Open and Low Fuel lamps. You also no longer have a PRNDL with the Z28 Cluster (perfect for floor shift conversions or 6-speed cars). Also, to allow the Z28 Cluster’s oil pressure gauge to display actual oil pressure, you will need to replace the oil pressure switch with a 9C1 oil pressure sending unit (no additional wiring involved in the Buicks). ’94-’96 Buick Roadmaster (Sedan or Wagon) with matte black faceplate for $385 shipped (within the 48 States). Other (than matte black) painted color faceplate adds $15. (Stick-on) Woodgrain or Carbon Fiber faceplate adds $35. (Stick-on carbon fiber has very limited availability). If you can send me a ’94-’96 Roadmaster cluster (or the connectors from a ’91-’96 Roadmaster cluster) you can save an additional $25. '95 DCM 9C1 with my LS1 and 6-Speed conversion. My Z28 Cluster Info Click Me! Z28 cluster builder/installer of the NorthEast, factory cruise control harnesses, overhead and floor shift consoles, tons of hard to find parts, etc... slowly selling off my B-body parts collection to reclaim space in my house/garage/attic/basement/shed. My 95 caprice cluster is on the fritz and I have been considering this rather than paying to have it rebuilt. 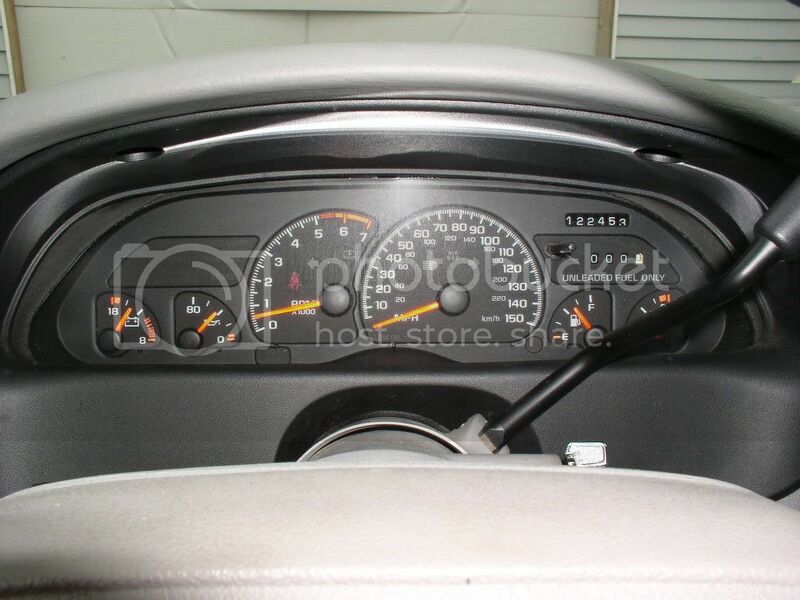 A few quick questions, do I have to hook up the tach and how accurate is the gas gauge? You do need to run my included tach wire from the PCM to the dash area. There is no tach wire in your car from the factory. 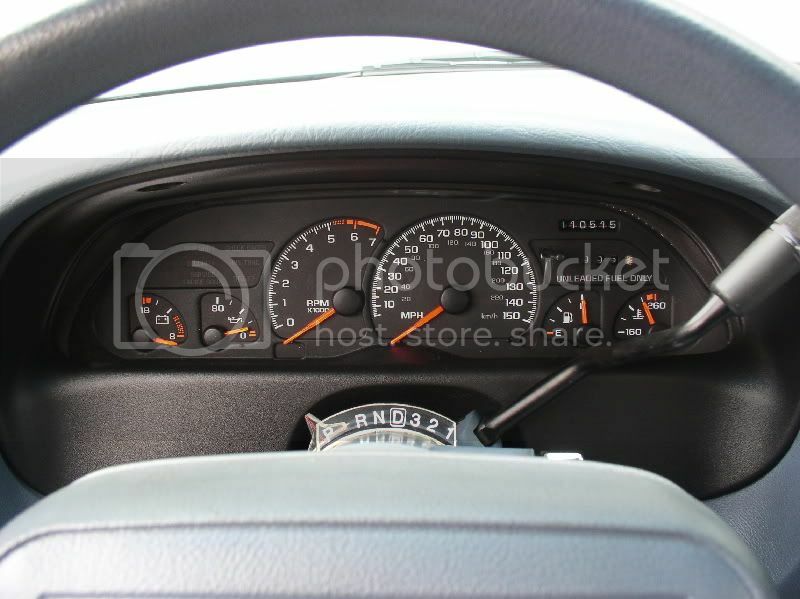 I check the accuracy of the needles on all the gauges when I complete a Z28 Cluster build. My bench test set-up allows me to test the functions of all the gauges, and if i find the needles are displaying inaccurately, I reposition them and check them again. My test set-up tells the Z28 Cluster that the 'gas tank' is full, so i calibrate the needle to the full line on the gauge. This will not 'fix' an issue you may have with your fuel level sending unit inside your tank. Email me at [email protected] if you have any questions, or to place an order. Attempting to send you a PM. It appears you are full up. I will e-mail you. PM ME FOR BLEEDER VALVES. Tim, I replied to your email. Sounds good, I wasn't sure if it would function or not if I were to leave the tach unhooked. It will be a while before money is right, but how long does it usually take from payment to shipping? Just curious so when I am ready to order I can ballpark the mileage. ...how long does it usually take from payment to shipping? It usually takes me a few days from receipt of payment to complete a Z28 Cluster build and get it out in the mail. going to get this for my 94 eventually. gonna start the mileage at 0 on a rebuilt engine. For future reference. I want to do this conversion on my car once I have it running right again. Quick request, does anyone have a picture of the Z28 clusters with the white needles?